Studying Kazakh this summer, I’m impressed by how Kazakh linguists are steadily replacing Russian words with Kazakh ones. While everyone mixes the two languages freely, scholars vigilantly separate them. In fleshing out Kazakh as a versatile 21st century language, they simply create new Kazakh words whenever there’s not a good one handy. This can drive me crazy, when new words multiply faster than I can learn the old ones! But wanting to better understand this language, I sat down last week over coffee with a local Kazakh teacher, Beybit*. For this blog, he agreed to talk with me about how so many new Kazakh words are being introduced, and what it means for Kazakhstan’s language development projects. Altin Alma, or golden apple. 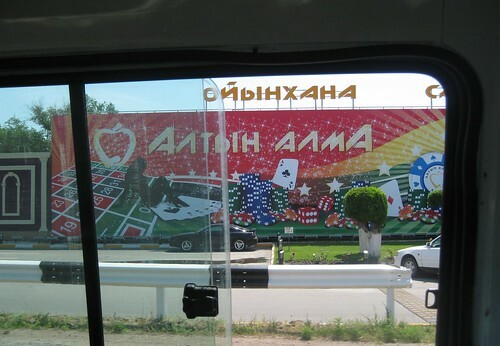 New (presumably Kazakh-language) casinos abound in the resort districts near Almaty, Kazakhstan. As with many “national” languages in post-Soviet states, the Turkic-based Kazakh language was shunted aside during the Soviet Union. From the early 1920s until Kazakhstan gained its independence in 1991, Russian was king. And for those living in the countryside, knowing only Kazakh was a barrier to moving up in the world, as most urban elites conversed only in Russian. But in the last twenty years, that’s all changed. As in many formerly Soviet countries, Kazakh has been elevated to First Language, with other languages distantly behind. Now, what matters for language testing, government jobs and scholarships, and getting your voice into the media is Kazakh. As the languaeg is promoted in once-Russian areas of the country, school children struggle to master a language not spoken at home or on the streets, university students from for the new “Kazakh IELTS,” and young Russians and Tatars look wistful when they hear that I, a foreigner, have access to intensive language classses that they simply don’t have. She’s startled when I use new words. And sometimes the words startle me, too. The Russian internet is replaced with galamtor (“world-net”), and vocab lists give me microtolkini pesh (“micro-wave oven”) for microwave oven, and sokyrishek (“blind-intestines”) for appendicitis. Yes, it’s a giant appendix. Or for Kazakh identification purposes, sokyrishek. You’re welcome. “We won’t use words from Russian,” he says. “Okay, if those Russian words are [technical] terms, then we can use them: kompyuter, internyet.” Beybit notes that Kazakhs have translated even these words, but seems to realize that many of the young people around him will never learn these words. “…Of course, a sauatti (literate) person should know the other words,” he adds. Beybit says Kazakhs can borrow freely from other Turkic languages, as they have common roots. But Russian and Kazakh aren’t related, so they should never be mixed. Beybit nods, stirring his coffee. He says that languages like Kazakh can simply be lost (jogaltip alyi mumkin). Beybit picks up a small black USB-drive full of language materials, and pulls off the rounded cap, showing it to me as the example of a foreign object. Yes, I nod. I’ve seen some sort of article in Time or Newsweek recently [but somehow I can’t find it online to link for you! ], and I describe it to Beybit. Language scholars were suggesting that if you look over thousands of years of history, the more frequently words are used, the more quickly they’re adopted and longer they remain within a language. Beybit agrees. Why Make Learning Three Languages Harder? I was recently at the beautiful new Nazarbayev University in Astana when the president paid a visit. 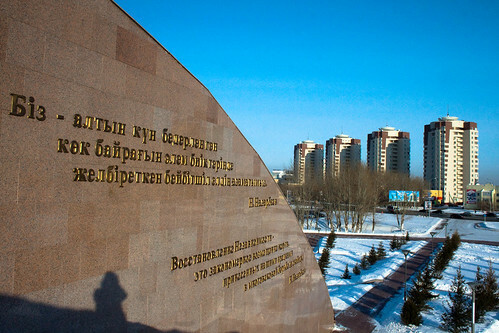 As President Nazarbayev toured the palm-tree covered atrium, glossy white science labs, and library filled with new databases, he stressed to the assembled students and journalists how important it was that Kazakhstan’s citizens learn fluent Kazakh and English along with Russian. I grew up in mono-linguistic middle America, so this language project is amazing to me. And since I’m a little lazy, and learning to speak three languages equally well is hard, I’ve ben wondering why we can’t just let people mix all three. Kaz-Russ-Lish? It sounds beautiful to me! But in talking with Beybit, he doesn’t think this kind of mixing makes sense in the long run. When I press my beautiful KazRussLish idea on him again, he shakes his head. “We can’t let this stand. First, because it’s not lovely. Secondly, it’s illiterate. And third, it isn’t useful – it’s repetitive. “Ya coffee uzhe iship aldim,” I joke, finishing and setting down my coffee in three languages. But three languages?! I ask again. This blows my American mind. “To learn three languages, this is of course hard but possible. Sauley, you’re learning three,” he reminds me. “Of course I could study English for twenty years and not speak it like you do. Keibir wunderkind boladi, akil goi, yes. For a child genius maybe it’s possible. “But most people can’t learn all of them completely, and they don’t need to. There are different languages for different situations,” he reminds me, speaking of what linguists would call registers. My wry blog-writing register, for instance, is different than the very respectful register I use for emailing my boss, or the complete nonsense that I IM to my little sister when we get going really fast. 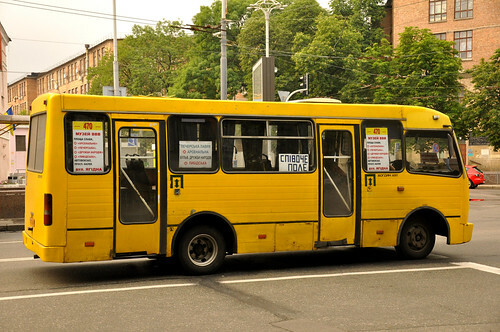 Everyone has these different registers, Beybit says, and this means you may only need certain kinds of language, depending on who you need to interact with: “So if I speak on the street, I speak simply… When I get off a crowded bus, I can just say otip keteinshi (let me pass)! “But we also have a resmi, sipayi tur, a polite form for that. So to make it lovely…”—and he gives me four ridiculously complex ways to ask very nicely if I could just please slip off the bus. I start to interrupt but Beybit smiles, anticipating my objection. “No, you won’t learn of all of it in class. You learn one form there, and gradually you’ll recognize related ones. At first it’s easier to learn by using Russian jargon, but… tildin maginasi tusinbei. You won’t understand the heart of the language. Astana, by kersy83. Presidential quotes in Russian and Kazakh. A few weeks before meeting with Beybit, I had walked around town with a visiting Hungarian professor, chatting about life in Kazahkstan. When I described all these new words, Dr. Futo said his own people, the Hungarians, had gone through a purification process in their own language, replacing “outside” words like piano and plough with new native ones that sounded more “Hungarian.” Yes, it was hard for the first generation, he said, but now everyone speaks words that were once completely new. But sokirishek? I question. If appendicitis is a word shared by Russian and English, why not use the word everyone in the world will understand? Time is of the essence with these things! I wonder about this though, as talented Russian and Kazakh kids from rural areas might want a great career as an international oil engineer, but never get the elegant Kazakh and English langauge skills that they need to go to a good university. Like Beybit, they may struggle to learn other languages later in life, skills that might allow them better jobs or the opportunity to travel abroad. Learning languages isn’t as easy as desire. But Kazakhstan lets me see that if a nation has the will and the resources, they probably can do this. By developing such language programs, they can hold on to a multi-ethnic cultural heritage at home. And at the same time, they set themselves up to better level with all players on the international scene. It’s a crucial play in a region whose natural resources and diplomatic relations are heavily fought over by US, Chinese, Russian, Turkish, and Arab firms alike. And perhaps when citizens of Kazakhstan and other Central Asian republics can advocate for themselves in many languages, then they can better speak up to these powers. Charting their path on their own terms may strengthen the success of these countries. And that, it seems, is something of benefit to us all.